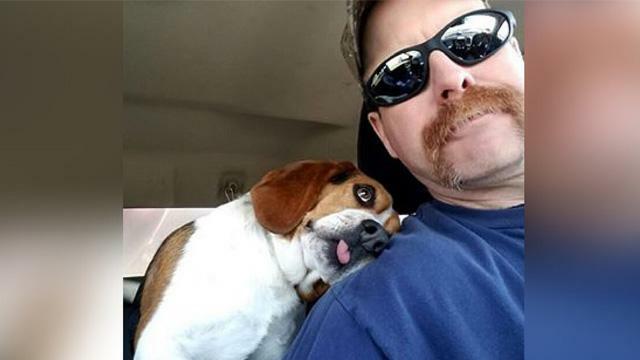 Gregory the beagle was brought to a kill shelter in Ohio where he was categorized as a “healthy stray.” But as soon as the staff discovered he’d tested positive for heartworm, they put him on the euthanasia list. Gregory had just two days to be rescued before he was scheduled to be put down. Things weren’t looking good for the helpless pup. Enter Schenley and Joe Kirk, who runs HOUND Rescue & Sanctuary from their home in Findlay, Ohio. The Kirks have dedicated their lives to taking in abandoned pets or animals on the brink of euthanasia. Schenley and Joe heard Gregory’s story and knew they needed to rescue him before it was too late. So, on May 1, 2018, Joe broke Gregory out of the kill-shelter and the pair embarked on his “freedom ride” back to HOUND. Joe usually keeps the dogs in crates to ensure a safe transport home, but Gregory was so excited to be leaving the shelter that Joe decided against the crate. Instead, he tethered Gregory in the back seat to give him some extra space. That’s when Joe felt something brush up against his arm. He took out his phone and sent his wife a collection of photos taken during Gregory’s the freedom ride. “The BEST Freedom Ride Picture EVER!” Schenley wrote on Facebook. “Pulled from the Euthanasia List at FCDS today by HOUND Rescue and Sanctuary, Gregory is one thankful and appreciative Beagle! He KNOWS he is SAFE! He is heartworm positive and will be going through treatment, but he knows he is in good hands! We will get him healthy and provide him all the love he so deserves and a wonderful future! But the Kirks had no clue they were about to thrust Gregory into the spotlight.